BANNU: Several people were injured when activists of Pakistan Tehreek-e-Insaf (PTI) and Jamiat Ulema-e-Islam-Fazal (JUI-F) clashed here on Thursday. 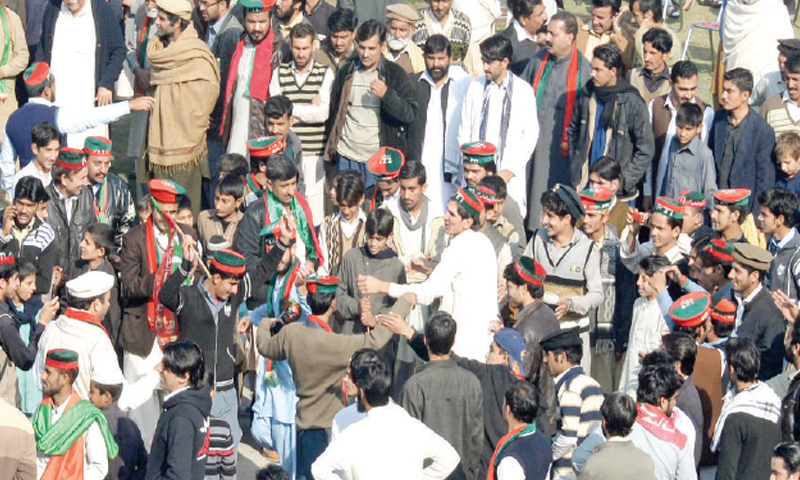 According to details, a large number of supporters of PTI and JUI-F had gathered outside Bannu Judicial Complex to get information about the results of candidates of respective parties. When the result of provincial assembly constituency PK-90 was announced according to which former federal minister Akram Khan Durrani was declared successful, his supporters started chanting slogans. Activists of the rival party also started chanting slogans which led to a clash in which both sides exchanged blows, kicks, fists and also pelted stones at each other. Several people were reported injured in the clash. The police reached the scene and opened aerial firing to disperse the rowdy crowd. The injured were shifted to a hospital, and the police after registering a case into the incident have started an investigation.